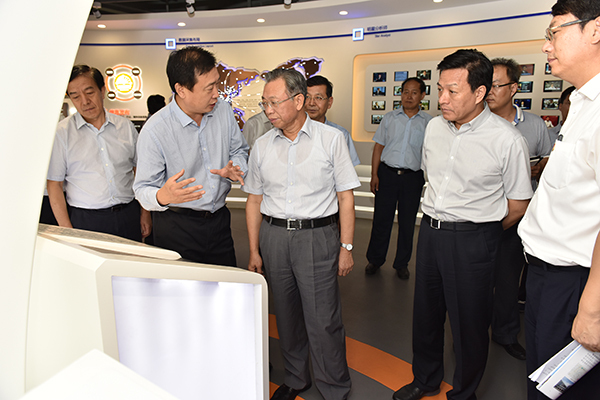 Liu Jiayi, secretary of the CPC Shandong Provincial Committee and chairman of the Standing Committee of Shandong Provincial People’s Congress, came to guide work on August 14, 2017, accompanied by Hu Wenrong, Standing Committee Member of the CPC Shandong Provincial Committee and secretary-general, Zhou Lianhua, secretary of the CPC Zibo Municipal Committee and chairman of the Standing Committee of Zibo Municipal People’s Congress, etc. 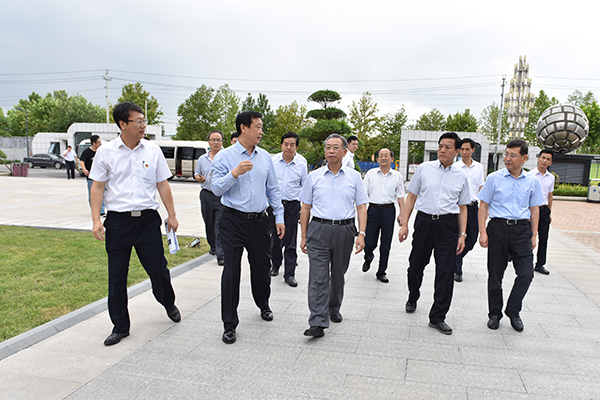 Liu Jiayi (middle), secretary of the CPC Shandong Provincial Committee and chairman of the Standing Committee of Shandong Provincial People’s Congress, arrived at the SCI industrial park to guide work. SCI president Jiang Hulin reported the development of SCI from the perspective of entrepreneurial process, product layout, service pattern, standardization, client cooperation, etc. and emphatically introduced "SCI Information Service Platform Construction Project". 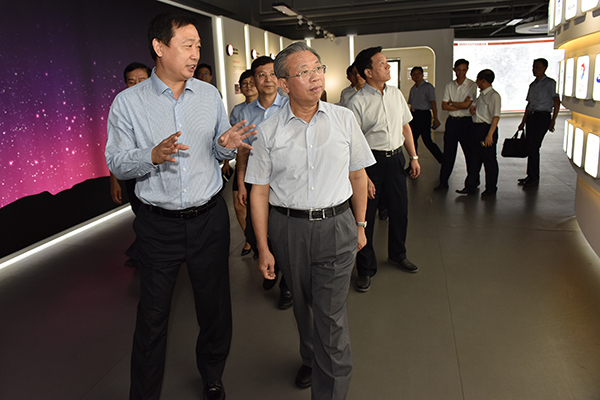 SCI president Jiang Hulin was reporting the standardization of SCI to Liu Jiayi in front of the exhibition area of the commodity information service industry’s data processing standardization system. Jiang Hulin said that SCI takes “neutrality, profession, concentration” as the core values. After 13-year’s development, SCI provides more than 1,300,000 clients in over 30 countries with market information, consulting service as well as event and exhibition service in the fields of energy, chemical, metal, agriculture, etc. SCI now owns 673 product websites and studies nearly 10,000 products. Besides, SCI cooperates with National Development and Reform Commission, National Bureau of Statistics, Ministry of Agriculture, etc. on price monitoring, index development, data analysis, macro-regulation, industrial restructuring, supply-side reform policy making, etc. More than 500 media including Xinhua News Agency, CCTV, PR Newswire, etc. take SCI as their regular information source.As an important supporter for the commodity information service platform, SCI industrial park provides a solid foundation for the expansion of sales and analyst teams and serves as an important platform for the sustainable development. Liu Jiayi was visiting the exhibition area of client cooperation. The establishment of the commodity price benchmark was shown. Jiang Hulin said that the control over commodity prices has always been regarded as prime importance in the commodity information industry. The one who possesses the control will survive and thrive. SCI originally establishes the SCI Standard Price Assessment Standard (SPAS) and originates the SCI index for commodity, laying a solid market foundation and winning brand recognition. In domestic and foreign trade negotiations, SCI pricing benchmark and analysis have owned certain influence and authority. Currently, prices of more than 50 products are widely recognized and adopted as pricing benchmarks in and out of China. During the study, Liu Jiayi fully affirmed SCI’s achievements. He emphasized that China is rich in petroleum, natural gas, agriculture products, chemicals, etc. But the aphasia has always been a problem for these industries. He hopes that SCI can assume the responsibility and mission of the times and strive to grow into a neutral and impartial third party with international influence. SCI will also make new contributions to the economic restructuring and upgrading and construction of a strong economic and cultural province.